The next morning Nang Phom Hom told her new husband about her father. She said that Tarangsit must stay inside their room any time her father is at home and if he is found, her father would probably kill him. Tarangsit didn’t mind, he said; he would do anything to be with his beautiful wife. Chattan returned home soon after. He called out the girls’ names and they ran to greet him. Tarangsit hid inside. When her father kissed Nang Phom Hom’s cheek, he smelled something different and knew that she had been with a man. 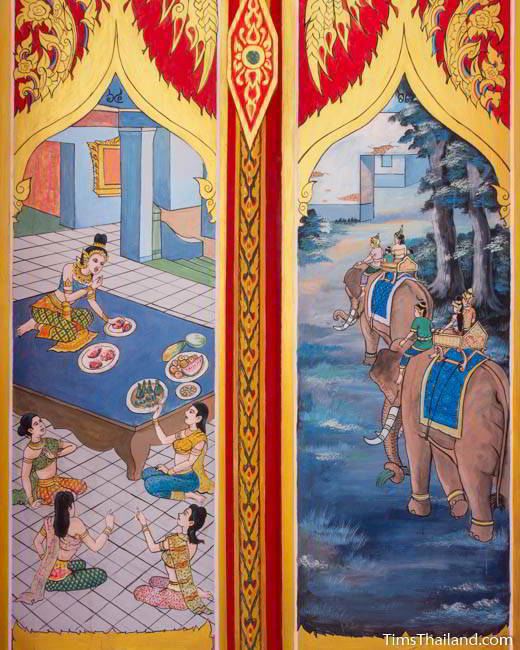 Nang Phom Hom denied it, saying that it was impossible for someone else to come to the elephant realm, but her father angrily insisted that he knew she was lying. “Please believe me,” she begged. He was tired, so he let the matter go and went to sleep. Chattan remained angry about it, but he never saw Tarangsit and did not discuss it again. 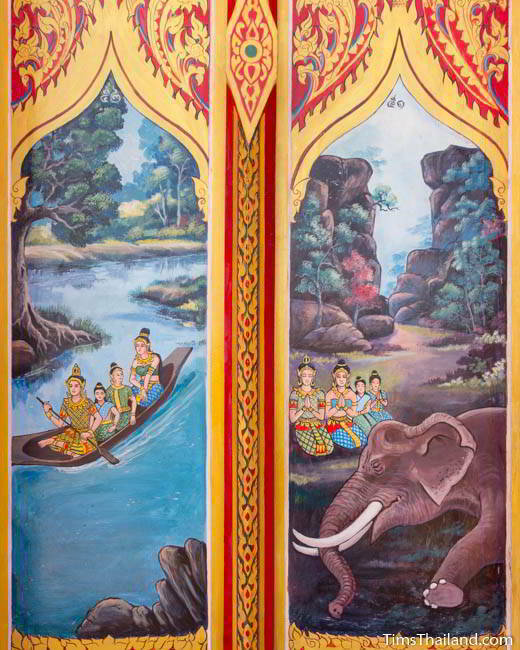 A few days later Chattan told Nang Phom Hom that he and many other elephants were going on a long journey to a distant land and would be away for many years. The girls would help her get food and if she stayed home and didn’t wander off into the forest she would be safe. He made no mention of smelling the man. Nang Phom Hom hugged her father good bye and watched him walk off into the forest. She would miss him, but was actually glad that he would be away so she could live without Tarangsit needing to stay hidden. 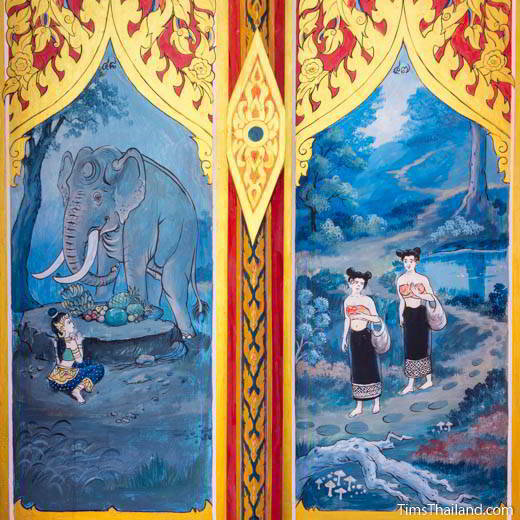 Nang Phom Hom and Tarangsit stayed madly in love and were completely happy. They had two wonderful children, a boy (named Sila) and a girl (Chada). After seven years together, Nang Hom Hom decided that they should move to Bengjan because the children would be lonely growing up in the forest without friends and family. Tarangsit agreed and was happy to return to his home. Nang Phom Hom’s two friends cried when she told them the news. They were going to miss her and prayed that she would not forget about them. Nang Phom Hom answered that she loved them and of course would never forget them. Since Nang Phom Hom was leaving, her two friends wanted to go home – they would not be happy here without her. Tarangsit wanted to leave right away, but Nang Phom Hom insisted that he go with the girls back to their home because the journey was dangerous. The girls walked into the forest with mixed feelings; sad to leave their friend Nang Phom Hom, but happy to reunite with their parents. It was a long trip and they had to sleep in the forest several nights, but the girls knew the route and before too long they reached their city. People who saw the girls were very excited and sent word of their return to their parents who ran out of their home crying and hugged them. 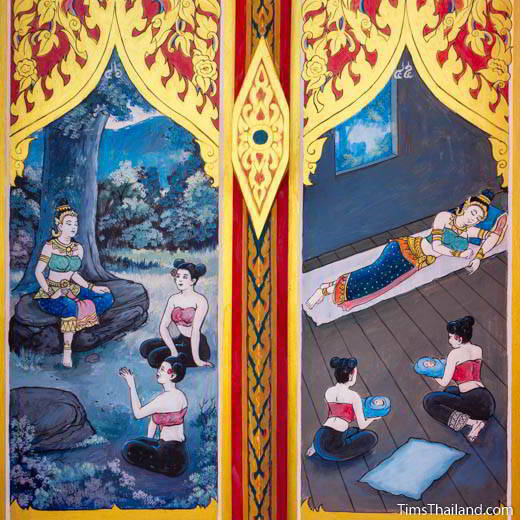 The girls introduced Prince Tarangsit and told of their adventure. The parents thanked him for bringing them home and the next morning Tarangsit walked back to Nang Phom Hom. While waiting for her husband to return, Nang Phom Hom thought about all the good things her father had done for her. She was deeply grateful for the kindness he showed her and she would miss him, but she knew that leaving was the right thing to do. 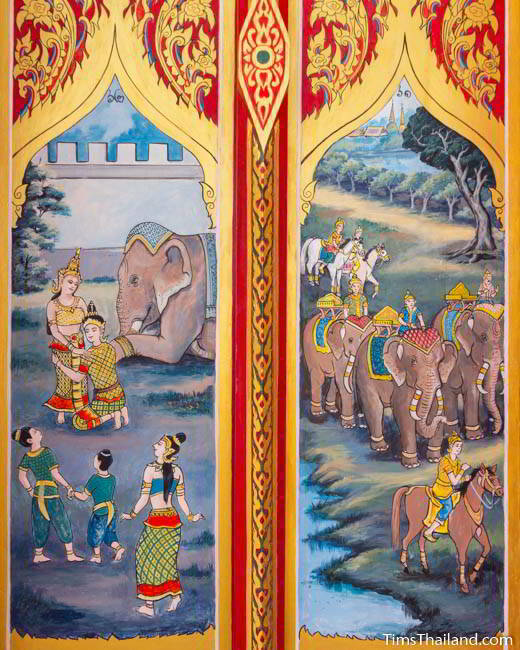 If any elephant saw Nang Phom Hom and Tarangsit leaving they would stop them, and her father might even be so angry he would kill them. 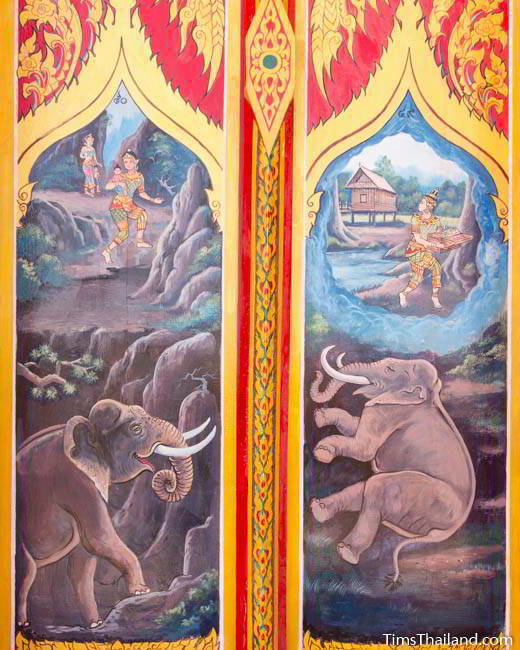 So they began their journey by crossing over a mountain – because elephants always stay on low ground. When Nang Phom Hom heard her father’s calls, she spotted him down below approaching in the distance. The four of them went to hide, but before they could get behind some rocks, Chattan spotted them. He begged his daughter to come down and talk to him, but she was frightened and stayed up high, listening to him from afar. Chattan told his daughter that he was not angry at her. He understood that she had become a woman and needed a husband. He just wanted to say good bye and send her off with some fatherly advice. She must always be generous and virtuous to everyone in her new family and be a good wife. Then he asked Tarangsit to always take good care of his daughter. If she does something bad, he told him, don’t discard her; instead teach her the right way. And then Chattan told them that he was dying. Hearing this news, Nang Phom Hom and Tarangsit were filled with sorrow and decided to go be with him. They bowed down in respect and Nang Phom Hom apologized for lying about her husband and for running away. Chattan forgave her and said that having her as his daughter had brought him great happiness. He had no valuables to give her, but she should take his tusks. They were magical and would turn into a boat when she needed one. Soon after, Chattan closed his eyes and died. Nang Phom Hom and Tarangsit gathered wood and after burning the body and doing the death rites, they continued walking through the forest. That evening, exhausted from a long, difficult trip, they reached a river and slept under a tree. In the morning they threw the tusks into the water as her father had instructed and a boat appeared. Tarangsit paddled from the front and Nang Phom Hom sat at the back, watching over the kids as they began their long journey to Bengjan. One day an evil ghost saw Tarangsit and wanted to have him. 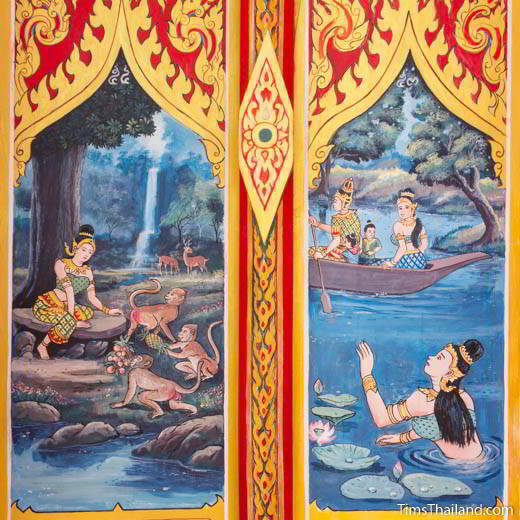 She took the form of a beautiful lotus flower right in the path of the boat and when Nang Phom Hom leaned over to pick it, the ghost pulled her into the water. While she splashed about, Nang Phom Hom was transformed into a monkey and the ghost took the form of Nang Phom Hom so perfectly that nobody could tell the difference by looking at her. 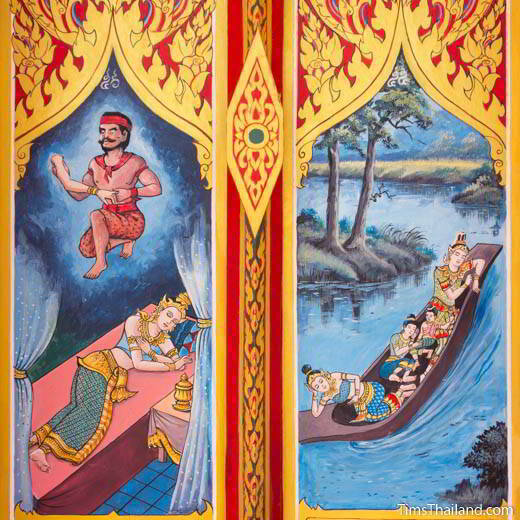 The ghost climbed into the boat and shooed the monkey away, and Tarangsit had no idea that this wasn’t his wife. The children, however, had watched their mother fall in the water and while they didn’t fully understand what had happened, they knew that there had not been a monkey next to the flower before their mother fell in and they suspected that the woman in the boat was an imposter. But their father would not listen to them and began paddling away, ignoring the children’s crying and the monkey’s frantic shrieking. Nang Phom Hom swam to the shore where she cried for hours. She was in shock at how suddenly her life had turned from wonderful to horrible. A troop of monkeys took care of her that night and the next day she headed toward Bengjan. She didn’t know where it was, but knew that following the river downstream would get her there eventually. They paddled downriver for many days, sleeping on the boat for safety. The children were sad and did not believe the ghost when she told them that she was their mother. Tarangsit, on the other hand, never doubted that the ghost was Nang Phom Hom. Sila told his younger sister not to worry, they had good karma and if they were patient they would get their real mother back. 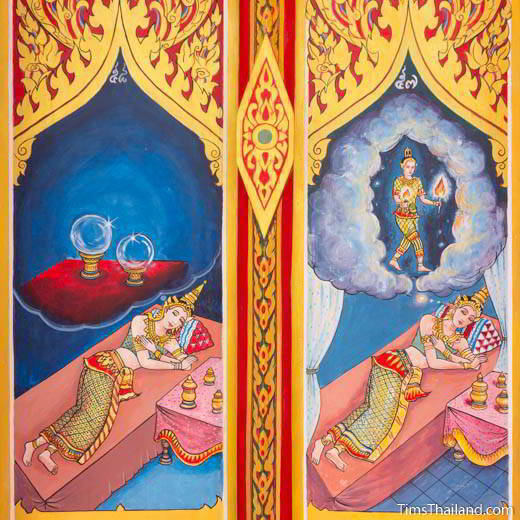 On the night that Nang Phom Hon was lost, Tarangsit’s mother, the queen, had a nightmare that a giant cut off her arm. The arm was symbolic of Nang Phom Hom being taken away, though she couldn’t know that at the time. Several days later, the queen dreamt of her son. He was holding two lamps in his hand and she took them. Later that night she dreamt of two glass balls. These two dreams, she knew, were a premonition that very soon she would see her son and two other people with royal blood. The next morning the queen woke up feeling wonderful because of her dreams, although she told no one about them. Later that day, Tarangsit arrived at the port. Everybody was thrilled to see him again, and as the news spread people ran out to greet him and his family. 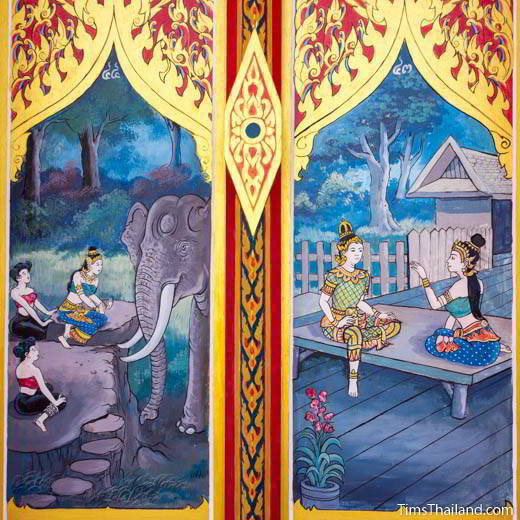 A grand pageant with music and dancing was quickly arranged to go forth from the city and welcome Tarangsit home. At the port, he and his family were put on the backs of elephants to be paraded around the city. When the parade arrived at the palace, the king and queen came to greet their son and his family. 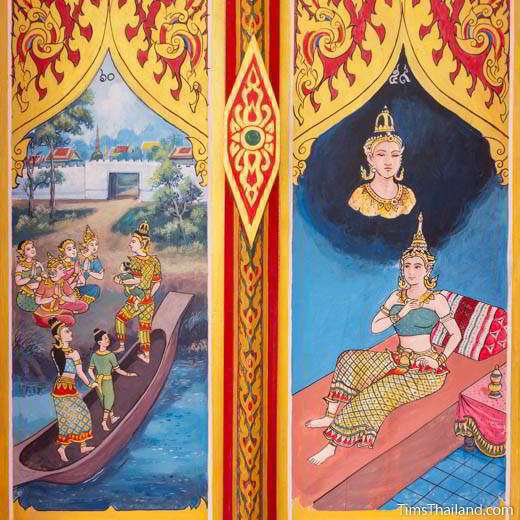 The queen wondered why her dream said two other royals were coming but there were three people with Tarangsit. But she was so happy to see her son that she just put the matter out of her mind. They held a big celebration with a bai-sii su kwan ceremony and every kind of food. The ghost only ate goy and other raw meat foods. Many people noticed this odd behavior, but not Tarangsit, who was occupied talking to people he had not seen for seven years.